Still reeling from the shock of learning that Jay Garrick (Teddy Sears) was in reality Zoom, the dark speedster that has been dogging him since the breaches to Earth-2 were accidentally opened, Barry becomes obsessed with increasing his speed. He goes searching for any means to become faster without resorting to Velocity 9. Barry takes a break to join the Wests for dinner and learns that Iris has gone out on a date with her new editor, but that she is also holding back from doing more with this new man because she still misses Eddie (Rick Cosnett). A conversation with Wally West (Keiynan Lonsdale) during dinner about studying the journals and notes of late car designers, and the observation that this is the only way to know what these deceased geniuses thought since it is impossible to talk to them in person, leads Barry to a crazy idea that might be his one hope to up his game: get help from his arch-enemy, Eobard Thawne in the past. With the help of Caitlin and Cisco, Barry goes back in time one year, to the point when he first encountered Hartley Rathaway (Andy Meintus), aka the Pied Piper, and plans to take his younger version’s place and pump Thawne for all the information he can. Barry is able to accelerate fast enough to break the time barrier, but when he does, he encounters a time wraith, a being that hunts down speedsters. Barry believes he has lost the time wraith as he arrives at the point and time when he first fought Hartley. Barry takes out his younger self and easily defeats the Pied Piper and takes him back to S.T.A.R. Labs. 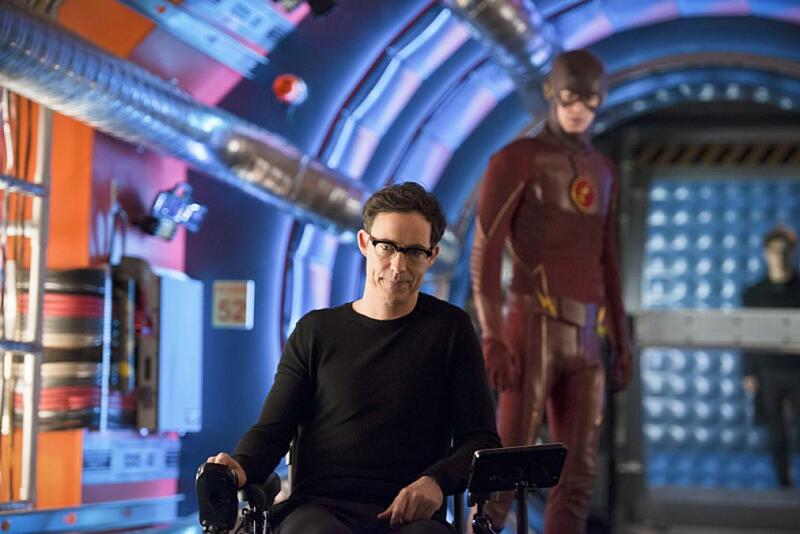 Once Hartley is secured, and this time his implants that counter his Tinnitus, but also are laced with explosives, are confiscated, Barry begins to question Thawne about ways to increase his speed. When the time wraith shows up at the Central City Police Department though, the Reverse-Flash quickly realizes that this Barry Allen is out of time, perhaps in more ways than one, and subdues him. When questioned, Barry tricks Thawne into believing that he has helped him return the Reverse-Flash to his own time in the future, but that he needs to stop the singularity that formed in the process. Barry also tells Thawne that he has a hidden letter that explains who the Man in Yellow really is and how the Barry Allen from this time can stop him, should Thawne kill him now. Stalemated, Thawne gives Barry what he wants, the answer to upping his speed: tachyon enhancement. Meanwhile, the time wraith tracks Barry to S.T.A.R. Labs and attacks Caitlin and Cisco. Their only hope is to hop into the cell holding Hartley. As the time wraith starts to breaking in, Hartley discovers that the right sound frequency can chase the time wraith away. But Team Flash knows this thing will be back and they need to find a way to stop it for good. Barry goes to the police department to see if there is any evidence that can help him stop the time wraith and he runs into Eddie. 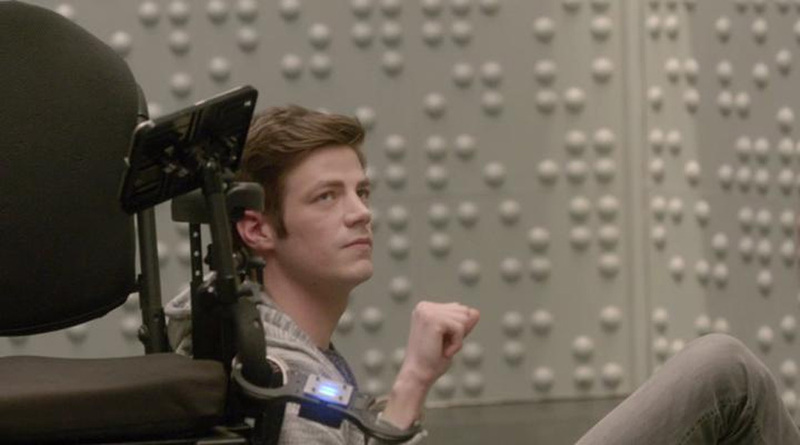 Barry takes the opportunity to make a recording that he hopes will be of help to Iris. When Barry returns to S.T.A.R. Labs, his cover gets exposed when the Barry from this timeline shows up and he has to come clean to everyone about who he is. But now that Team Flash knows who he really is, and where he is from, buys him time, literally. 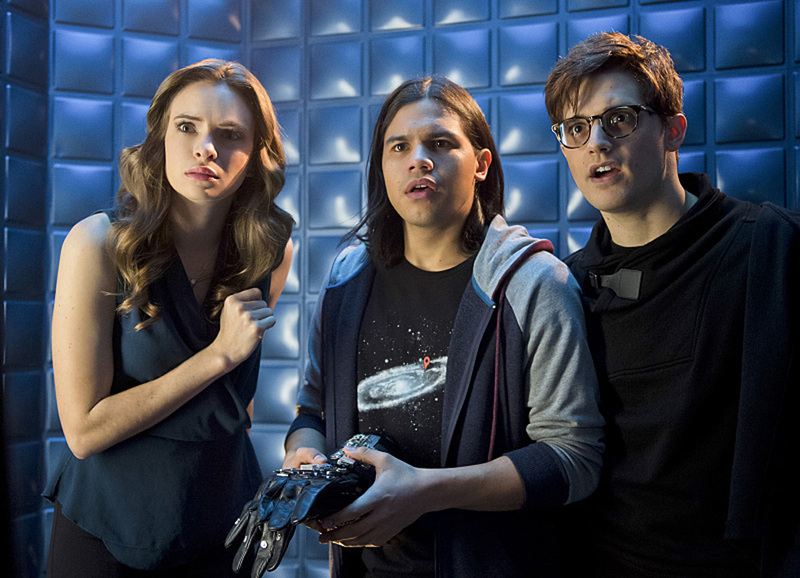 Barry tasks Caitlin and Cisco with finding out how to beat the time wraith in the future. The hope is that when he returns to his own time, they will have figured out how to do it. I love time travel stories when they are done right and “Flash Back” is so, SO done right. 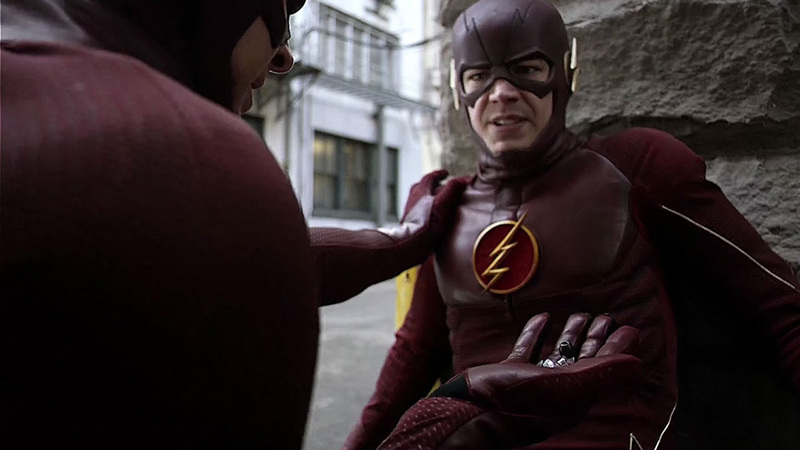 The episode perfectly incorporates events from the first season episode, “The Sound and the Fury,” and turns the Flash Universe on its ear in the process. The episode also gives us some of the best moments from this season, so far, and all of them center on returning characters from the first season. First, this episode highlights what a talent the show has in Tom Cavanagh, who really turns in a stellar performance as both Harry Wells and Thawne this time around. The Reverse-Flash is always going to be the Flash’s arch-enemy, his yin to his yang and getting to see Cavanagh play Thawne one more time is a treat. The seething menace and the pure hatred that was always below the surface for the Flash in the first season gets to boil over wonderfully and it is just great to see Barry and Thawne cross swords here. It was also great to see Andy Meintus back as Hartley Rathaway, especially since the biggest twist in “Flash Back” comes when Barry returns to the future and finds that the Pied Piper is the one who has figured out how to stop the time wraith and that somehow Barry going back in time, and the changes he has caused, now mean that Hartley is now on the side of Team Flash and appears to be an ally and close friend to everyone. Finally, we get to see Rick Cosnett back as Eddie Thawne. Although his role is fairly brief in this episode, Cosnett reminds us of what a decent, good man Eddie was. The message that Barry takes back to Iris from her lost love reaffirms her of how much he cared for her and how much, more than anything else, Eddie wanted Iris to be happy. It’s just what she needs to take the step to move on with her life. And also, it speaks volumes about what a great guy Barry is that he thought to do this for the woman he loves. Besides some wonderful performances, this episode is loaded with so many fun bits. Everything from using Rick Astley to counter Hartley’s Tinnitus (and torture him in the process) to learning that Barry and Cisco have watched Star Trek II: The Wrath of Khan together five times. Also, for old school comic book fans paying attention, we get to see the actual speed formula presented (well, at least the one that Johnny Quick used in the comics). The episode is just further proof that The Flash is the best superhero show on the air right now, and certainly the most fun show, period. My one complaint is that the introduction of time wraiths could make future time travel stories problematic for the Scarlet Speedster, but this is a minor quibble for what is an outstanding episode. I have to give “Flash Back” my highest score, 5 Stars.